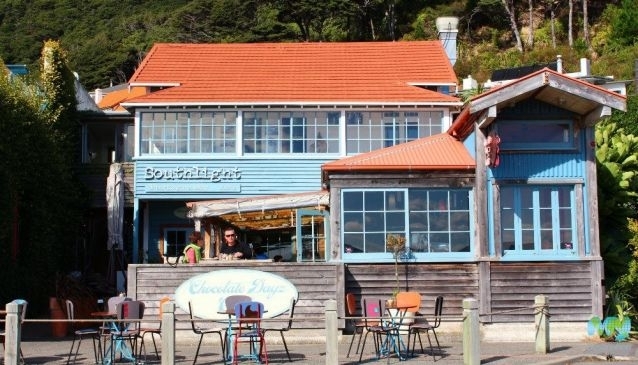 With a prime spot overlooking Day's Bay, Chocolate Dayz Cafe offers one of the most scenic spots to enjoy a cup of coffee in Wellington. The licensed cafe offers offers a breakfast and brunch while there is the option to enjoy a beer or glass of wine later on as you soak up the harbour views and the backdrop of the bush. The all day menu serves until 3.00pm and includes fishcakes, fish and chips, pasta of the day, soup and salad options. There is a kids menu and a selection of sandwiches and deli foods that can be eaten at the cafe or, ordered as a 'takeaway'. The cafe has both indoor and outdoor seating areas.